Providing Help for Children with Special Needs? Earlier this year, the Autism Awareness site posted a social meme regarding the use of essential oils in the treatment of Autism put together by an independent distributor of one of the larger multi-level essential oil companies. As a Registered Clinical Aromatherapist and the mother of a son with Autism, I was very put off by the recommendations being shared virally as any essential oil regimen for Autism should be a properly educated one. I did share my concerns with the website, but received no reply. While I am happy that the use of essential oils is becoming more commonplace, like others I have concerns about the advice being shared virally. I am profoundly disheartened by the apathy exhibited by many qualified practitioners who have become jaded by all the social debate over protocols shared by independent distributors online. We can’t give up! More and more I am being introduced to new essential oil protocols intended to treat children with intellectual disabilities and other comorbid neurological conditions. This came before I learned from a colleague about a Pediatric Autoimmune Neurological Disorder Associated with Streptococcus bacteria (P.A.N.D.A.S. or P.A.N.S.) in which an child presents with motor tics and symptoms similar to Tourette’s Syndrome. She inquired as to what I knew about this disorder and treating it with essential oils. A new client came to see her regarding her three children afflicted with the disorder and an essential oil regimen she had been using to treat them. 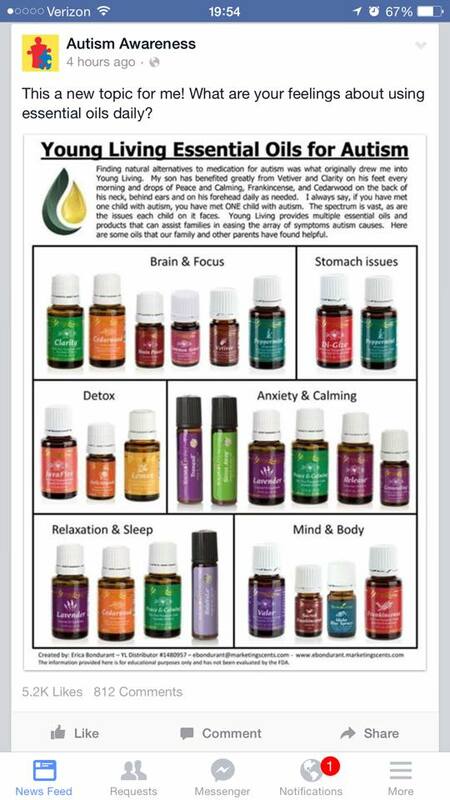 I was appalled by the copious amounts of essential oils ingested on a daily basis and the overuse of neat oils used topically in a manner similar to the Raindrop Technique employed by one of the larger essential oil distribution companies. In reading through the website connected to this regimen, there is nothing to indicate that any professional put together this “targeted” treatment, yet the family has set up the site to advise the parents of other children with the disorder. They provide consultation and instruction on where to purchase and how to use the essential oils. While I am pleased for the family that they have found some help for their own son, I shudder at the thought of their advice to others based on their experience as P.A.N.D.A.S. , as in autism, is not the same for every child. I am a huge proponent in the use of natural means to support the treatments offered to those children with Autism and other comorbid disorders, however I am heartsick with the careless disregard for safety with some of the advice provided. Parents of children with disabilities are already under tremendous stress and always looking for something…anything that can help their beloved child. My fear is that they have become prey for those looking to make a buck by “developing” these new and potentially harmful practices and offering hope to parents. As responsible practitioners, no matter how weary you have grown with the social media sharing, we are bound by the responsibility of our education to advise when we see a potential for harm, especially to a child. On April 7th, a local news station in Central Florida reported that a mom received a letter from the principal of her son’s school in which the principal threatened to suspend her son because of the essential oils she uses to treat the behaviors associated with his autism. His mom uses three essential oils (unknown which oils and whether or not they were single oils or blends) on the back of his neck and behind his ears each morning before school. While none of the students ever complained of the smells and no one had ever asked to be moved, she got a letter from the district stating that the odor from the oils has presented a problem in the environment for the other students and staff. Add to this the age-old question “why is it okay to put chemical smells into the environment, but not natural ones?” By the next morning the news reported that the mother had won a battle with the Lake County School and the decision to suspend her child. District officials said they will work with the student’s family and school administrators to find a better solution, however the news report indicated that the administration was at a loss as to how to do this (http://www.clickorlando.com/news/mom-says-school-threatens-to-suspend-autistic-boy-over-essential-oils/32263998?utm_campaign=Live%20Well%20Learn%20Well&utm_content=14187170&utm_medium=social&utm_source=facebook). I was really struck by this report as a mom of an autistic child. While I am not condoning the current way she is using the essential oils on her son, I do support her choice of using the essential oils with him. After seeing this report and watching the news report, I contacted the superintendent of the school district where he goes to school, as well the news reporter to offer my support for safe and responsible uses that could be employed in the school. I didn’t expect much to come of it, but hoped that my letter would be well received and considered by the district. Today I received an email from the superintendent to say that they were happy to receive my letter and will be in touch regarding the information I shared. We may not always be heard, but we have to try. Every one of us has a family member or knows someone with a child with Autism of other (mental or physical) health concern. Please get involved to promote better safer practices. Below are some of the suggestions I shared for essential oil use in the school. Twelve drops of an essential oil blend can be put into a 10 ml roller bottle with the bottle topped up with carrier oil. The blend should be rolled onto the clavicle before school and again when returning home from school. Also, it can be done one more time before bed to aid sleep. The dilution should be 1.5% which is 15 drops in 50 ml of a carrier oil or unscented lotion for general topical use. A hand massage can be given at school with the scented lotion if there is a provision for that or it is in his IEP. Personal inhaler. Add 20 drops of the essential oil to the wick, then place in the tube. Push the cap tightly into the bottom and replace the cover and screw to close. To use: just inhale through the left nostril while holding the right one closed, then inhale through the right while closing the left, and repeat. The other students will not smell the essential oils. NOTE: Some schools require a doctor’s note for this. Aromatic jewelry that looks like a wristwatch can be purchased very inexpensively from a company called Diffusing Mama’s (www.diffusingmamas.com). These have a simple band of black rubber the runs through the bottom of a hinged locket that is perforated. There is a little wool wick inside. Place 3-4 drops of essential oil on the wick, place it in the locket and close the cover. Inhale as needed for stress and anxiety. Diffusing Mamas also makes necklaces (blue and black rubber with lockets with arrow heads and soccer balls). This is better yet as it is under his nose and stays personal to the child. The transdermal patches are from a company called Naturopatch of Vermont. For a child, the patch can be cut in half. Place 1/2 patch on the skin on the inside shoulder and dress as normal. The essential oils are suspended in an olive oil base and the patch offers a slow release. When the child bathes in the evening, he can slowly peel it off and a new one can be put on the next morning. These are already impregnated with the essential oils and come in tins of 10 and individual use envelope packaging. The other type of patch uses an extra step. You peel off the top layer foil to uncover the scent chamber, then peel off the covering of the adhesive side. Stick the adhesive side to a shirt collar and you are good to go. These can be purchased at www.jodibaglien.com. Jodi created these patches for hospital use and they are being used successfully in hospital systems and nursing homes throughout Minnesota. Lora Cantele is a Registered Clinical Aromatherapist and the editor/publisher of the International Journal of Professional Aromatherapy, and co-author of The Complete Aromatherapy & Essential Oils Handbook for Everyday Wellness. Tagged approaches to healthcare, Aromatherapy, Autism, children with special needs, essential oils for autism in school, P.A.N.D.A.S.